The Schwinn 170 Upright Bike is the bestselling upright exercise bike. It’s not the most affordably priced bike. Although it still well priced. Especially when you considered its features. These include pre-set programs, magnetic resistance, speakers, fan and more. There’s plenty included for a convenient and “enjoyable” low impact cardio workout in your home to help you achieve your fitness goals. It keeps you in out of the bad weather and saves on journeys to the gym and the fees too. But there are thing to be aware of when using it. That might not be immediately obvious from the description of the bike. In my review I look at all these to see how well it performs in getting a cardio workout to stay in shape, lose weight or for training when you can’t get outside. The first thing to look at is how stable is the bike is as you workout. The main construction is a steel frame and stabilizer bars with a plastic shroud. It is constructed well so that is doesn’t wobble or shake as your workout at all intensities. If you find the bike rocking a little side to side you can level up the bike by adjusting the levelers under the end caps on the back stabilizer bar. It has good length of warranty with 10 years on the frame, 2 years on mechanical, 1 year on electrical and 90 days on labor. It’s one of the longest available. There are hardly any maintenance requirements including cleaning and checking the pedals etc and tighten as required. People mention the quality of construction and two of the people who have been using the bike for more than year and it is still running well and being used regularly (and see ratings below). When it comes to the recommended size that the bike is best for Schwinn does not provide guidance, even when asked preferring people to try it out first – they have written that it is around 5 ft to 6ft give or take a few inches. From customer reviews it seems this is about right with people saying that it fits people between 5ft and 6ft 1 ins. The seat can be adjusted vertically and horizontally to get the proper fit for your legs for the most effective workout. The horizontal issue will help if you are taller and shorter to get a good comfortable position in relation to the handlebars so you’re not cramped up or stretching. However, the process should only take seconds once you’ve set the bike up for the first time and this only has to be done if it has been adjusted since you last set it up. The angle of the handlebars can be changed to get the most comfortable grip or leaning position for you. These adjustments are easy and quick enough so it can be used by multiple users – you can quickly be on the bike and getting your workout. The 25 levels of resistance is controlled through the console. They go from very easy to very hard (but probably not tough enough for elite athletes). The increases are incremental and the movement between the levels is smooth – there’s no jerkiness or no sudden increase/decrease in resistance that would add impact. The resistance is low maintenance and very quiet – it works by moving a set of magnets closer to and further away from a flywheel to increase/decrease resistance. They don’t ever touch so there is nothing to make a noise or wear down. When using one of the profile programs the resistance is automatically controlled by the program. However, if the resistance level is not right for you, you can adjust up or down to the level you want for that segment of the program. You can move the resistance up/down one level at a time by pushing the up/down buttons on the console, But you can also jump to one of ten levels (of 25) by pushing a quick jump buttons on the console. The levels are 1, 3, 5, 7, 9, 12, 15, 18, 21, 25. This is all covered up within the shroud at the front of the bike. This keeps out the dust and sweat as well as helping to keep it out of reach of children and pets. The flywheel diameter is about 10 inches and weighs about 13 lbs. It is perimeter weighted which helps to give it some inertia to help to keep a smooth pedaling experience. You’ll find at the higher resistance levels that it starts to pulse as the resistance works like a brake on the flywheel thus slowing it during the upper/lower parts of the stroke. The pedals are oversized with straps to provide a secure platform to push and pull as you pedal. It also keeps them in place as there is less chance of them slipping off. The bike is not designed for standing on the pedals for extended periods like you would on a spin bike (per supplier) – also the handlebars and dimensions are different. It is probably okay for short periods. However, some people have stood on the pedals and found it sturdy and comfortable (although there is one negative review that says it broke after a year of this type of workout). If you are looking for spinning type workouts then you are better taking a look at the best spin bikes under $500 (although you won’t get such a featured console, nor accessories nor magnetic resistance). But you can stand on the pedals and get a much more weighted flywheel for smoother pedaling motion. You can still get a very hard workout with the bike by turning up the resistance and pedaling hard with no issues with the bike – just not period of time out of the seat. It is possible to pedal backwards but there isn’t any resistance so it is very easy and won’t really help with strengthening your legs at all or really with cardio. It has a 3 piece crank with the arms about 8 ins long to provide a good stable and durable base for the workouts. You can change the pedals if you want -the thread size is 9/16 inch. The arms are curved so you shouldn’t have an issue with your ankles being hit by them as you pedal. The straps are plastic with holes that are put over a tab on the pedal. This can be a little tough at first until the plastic softens. You only have to it the once if you are the only one using the bike as you can just slide your foot on to the pedal. Seat. It is a large and padded bike style seat. Some people will find that is good for their sit bones and can exercise for als long as they want. For other it may take a little time to get used to it as with any bike seat. However, there are many who struggle with the seat as is the way with all bike style seats. You can try padded bike shorts or a get seat cover which seems to do the trick for most people. But for some they may want to change the seat to something more comfortable. If you want to change the seat you can do so with any other standard bike fitting seat. Handlebars. The handlebars angle can adjusted and are covered for a comfortable no-slip grip. To help when you want to lean on the handlebars the ends are turned up and there are 2 elbow pads to rest the arms on which gives good support and stop your arms from aching as they would if they were direct on the bar. Noise. It is a quiet bike. You can workout and watch the TV without turning it up and when others are sleeping you shouldn’t disturb them. Some ride it in the bedroom when others are asleep and they don’t wake them. (that wouldn’t work in my family!) It can be used in an apartment without your neighbors knowing you are. You might want to put the bike on a rubber exercise mat to stop any possible vibration being noticed by anyone living below you. Cleaning. The bike itself won’t create a lot of dust and dirt. Sweat is likely to be the main source of cleaning work on a usage basis. It can be very corrosive so should be cleaned up after use to stop it starting its damaging work. You may also want to put the bike on a rubber exercise mat to prevent sweat dropping on it. When you’re not using the bike it needs an area of 21.4 by 41.3 ins so you may need to store next to a wall or in a corner when you’re not using it. It looks pretty good too so it won’t be seen as an eyesore even if it is kept in your living room – it can also “call to you” to give you the hint to use it. To help with moving the bike from where you use to storage or anywhere else there are 2 transport wheels on the front stabilizer bars. Tipping on to them and use the wheels is straightforward and can be done by one person. They work best on hard surfaces. You may find they stick on carpet as they don’t have much clearance – so you may end up dragging rather than wheeling it. Also, you might want to be careful on a wood floor as sometimes these wheels can dent or scratch it. So, you might want to do a small test first. You are warned in the manual to make sure you don’t make very quick movements with the bike as this can affect the operation of the computer. The main part of the bike is together – the bottom frame and drive assembly. You are required to put on the stabilizer bars, pedals, handlebars, front support pole, console, seat post, drive shroud and water bottle holder. The instructions and diagrams do a good job of describing the process. The tools needed are included and adequate, although your own tools if you have them will make it go a little quicker. The assembly can be done by one person but it does help to have 2nd person to hold things in place while you bolt them on – this is in particular true for attaching the console where if you are doing it on your hand you’ll wish you had a third hand. The console is where you select your programs, see your measures and where many of the accessories are housed. It has two display screens so you can still see some of your measures even when you place your personal electronics in the shelf. They cover the upper display but you can see the lower display. The displays are backlit so can be seen in all light conditions. They display time, RPM, distance, pulse (when pulse sensors or non-coded heart rate strap worn), calories, resistance level, program profile, heart rate zone, program completed, intensity meter, user and goals achieved. The measures are split between the 2 displays. The upper display is the larger of the two measuring 3 by 5 ins. This shows you along the top the program you are following. In the centre of the screen is a grid with columns shows you workout course profile. The columns are a segment of the workout and the height lets you know the resistance level for that segment. On the left of the screen is the intensity level from 1 to 10 giving you an indication of the resistance you are pushing against (although there are 25 levels of resistance). It is a column of blocks that fill in the tougher the resistance – gives you a quick way to see. On the right side is a similar column of blocks to give you a picture of your heart rate zone – split between warm up, fat burn, aerobic and anaerobic. At the bottom of this display you have a goal display that shows you the goal selected (calories, time or distance), value to left to achieve goal and percentage completed. There is also an indicator as to user profile selected and a star to indicate a goal has been achieved. When a goal is achieved you get the star as well as “celebratory” sound. It can give you a bit of motivation to keep you going and put a little more effort. If you do place an electronic device on the console this display is covered up. The lower display measures 1 by 5 ins. On this display, which doesn’t get covered up when you use the media shelf the measures are in numbers (what is shown can be customized by the user). It is separated into 3 blocks. In the left block it shows speed and/or time. The central block shows distance, RPM or resistance level. The right block has heart rate or calories. Either side of the lower display are the up/down buttons to increase/decrease resistance as you go. Below the display area are the buttons for controlling and selecting the programs. Running down either side are 5 buttons to allow you to jump quickly to the resistance level you want. In the center at the top are 4 buttons – the quick start for getting started without selecting a program, pause/end for pausing or ending a workout, program button for selecting a workout program and one for goal tracking to display goals achieved by user. Below these are 4 direction arrows and okay buttons for making changes to programs, setting up users and also scrolling through the workout values in the lower display. There are also 6 indicator lights on here too, to indicate goal achievements – in last 30 days, in last 7 days, longest workout, calorie record, current workout or last workout. Simple though they are they can be motivating to keep you on track. And at the bottom is the left and right speakers, in the middle is fan and button for controling fan speed. Quick Start Program – this is the program you use when you just want to get on the bike and get busy pedaling and adjust resistance as you go. Profile Programs – There are 12 different programs. They are split equally into 3 categories fun rides, mountains and challenges. Each program is split into segments with variable amounts of resistance (usually) from one segment to the next. You can select targets for these – calories, time or distance. Fitness Test Program – With this you want to be seeing your score increase over time as your fitness levels improve as the result of you working out. You start by selecting whether you are a beginner or advanced. You have to use the heart rate sensors for the test. It runs you through the test and gives you a score at the end. Recovery Test Program This is done after you complete a workout. It lets you know how quickly your heart recovers from exercise. You use the heart rate sensors. It works out a recovery score by using your heart rate at the beginning of the test and deducts your heart rate at the end of a minute. There isn’t guidance as to what a good score is in the manual but you can find information about this online. Heart Rate Control Programs These programs work with a selected heart rate zone and change the resistance to keep you in that zone. You have a choice of beginner and advanced. Then you can choose your zone from 50 – 60%, 60 – 70%, 70 – 80% and 80% – 90%. You can then set your target for the workout from calories, distance or time. When you want to measure your heart rate you grip the sensors on the handlebars on the crossbar. You do need to grip both to get a reading. You need to be gripping them the whole time you want a reading. However, you may find that even with a good grip that you can’t get a reliable reading. This is a problem that can be encountered with any of the sensors on any bike. They can be temperamental at best. If you want to monitor your heart or use the heart rate programs it is worth trying them out as you might be successful. Fortunately, if you do have problems you can use a non-coded Polar heart rate strap if you can’t but this needs to be bought separately. This usually gives a much more reliable reading of your heart rate and you can also move your hands and put them where you are most comfortable. If you want to pause a workout or change it you can do this using the pause or programs button on the console. At the end of all the programs except quick start there is a 3 minute cool down program. The console displays your results during the program. programs for each person. You enter name, age, gender, weight, height and program preferences with targets. It doesn’t have a guest profile for when someone visiting that they can use. It assigns the person to the last profile uses unless one is chosen. You’ll have to delete this information from the user account if using Schwinn connect and myfitnesspal.com. to stop it messing up you numbers. It does beep when you hit your goals and make changes but this can be turned off in the set up menu if you want. To work it needs to be plugged into the wall using the supplied adapter and cord (110-120 V). If you unplug it the console stores your user data and profile. The manual that comes with the bike doesn’t give instructions on how to use the console. This needs to be downloaded from Schwinn’s website. To start the console you either plug it in, a button is pushed or pedals are turned over. It goes into sleep mode after 5 minutes of nothing happening. There isn’t an on/off switch. It comes with a good number of accessories with most of them included as part of the console. USB Charger. You can plug you devices into the console to charge them. It is a slow charge so when using it with a tablet it will prevent them draining but not charge them up. A phone or MP3 it will slowly re-charge them. Media Shelf. There is a shelf towards the top of the console for putting personal electronic devices. When you put one on there it does cover up the upper display (that shows your progress). They are held firmly in place. You should be able to read your kindle and tablet from the seat without shaving to strain your neck or eyes. Speakers. You can plug your MP3 player into the console using the supplied media cable. You select the music and change volume from your MP3 player. If you are keen on your music you won’t like the quality of the sound. Fan. This is a 3 speed fan . It will blow a gentle breeze on you. It may cool you slightly but it’s not as strong as an electric fan. Water Bottle Holder. This is on the front console support – about half way down. You have to slide the bottle in and out of it – so you may need to slow down while you do it. It will only fit a small water bottle. Depending on how high your TV is you may find the console get in the way of watching it unless you have the bike at an angle and not directly facing it. Overall customers are positive in their reviews. 81% rate the bike a 4 or 5 based on over 400 reviews online. Those that aren’t happy with the bike seem to be mostly from a few years ago. And it seems it may not stand up to those looking for very high intense and long hours of working including standing on the pedals for extended periods out past a year. Also there were some who received a bike damaged by delivery and it does appear that this isn’t such an issue recently. The Schwinn customer service haven’t always done a great job in a few circumstance. It is more likely those that have an issue after a year are likely to leave a review than those who are continuing to get a good workout from their bike. With that said, the majority like how quiet it is. They find it a well constructed bike with a good smooth action and they can just get on and workout whatever their fitness goals may be ranging from staying shape. losing weight or getting bike training for when they can’t get outside because of the weather. You do get a lot of good features included in the price, and customers are happy with the bike they get on the whole. It makes it good value for the money when you compare it to other bikes available. 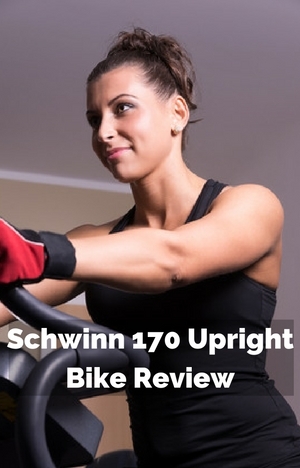 The Schwinn 170 Upright Bike is a bike that is a solid and quiet exercise bike that can help you with your cardio fitness, lose weight (with burning calories) and training when you can’t get outside. It’s not designed for those who want to stand up on the pedals or spinning workouts. Also if you are an elite athlete you may find it won’t stand up to the intensity you want over an extended period. There is plenty of variety with the console with 29 workout programs including profile programs (segmented workouts with varying resistance), heart rate control programs and fitness tests. There’s plenty to keep you interested and challenged. The range of variety allows it to be used by beginners and those wanting a tough challenge. The pedaling motion is smooth with only a variation occurring at the very top end resistance where you need to concentrate a little on your stroke. Overall you should get a bike that is low maintenance, quiet and provide workouts at the level of challenge you want to achieve your fitness goals. I dont consider an elite cyclist but a very fit one. And believe me the highest resistance setting on the 170 is more than challenging. The quick start feature lets me create my own program or what I feel is my level. Lately I start at level 9 for the first 2 minutes and alternate that with level 25. For a good 16 to 18 minute workout. This is a workout for those that are highly experienced. If so you could design something less intense according to your goals. Thanks for this. It’s great to hear how you are getting a great workout from the bike. Hi, Just bought the 170. I’m impressed. You may want to know and update your review in that the new model for 2017 has Bluetooth. Very nice. It automatically downloads to the Schwinn app. I’ve only been using this bike for a couple of days. I actually look forward to it! That’s great to hear you like you’re bike. I’m sure you’ll get plenty of good use out of it. Thanks for letting me know about the bluetooth – I’ll update my post to include it.